Mistaken for a lady's maid hired to help with weekend guests, Kendra is forced to quickly adapt to the time period until she can figure out how she got there; and, more importantly, how to get back home. However, after the body of a girl is found on the extensive grounds of the county estate, she starts to feel there's some purpose to her bizarre circumstances. Stripped of her twenty-first century tools, Kendra must use her wits alone in order to unmask a cunning madman. Does the cover of this book not beckon you to read it!? Yes, I will admit, I judged this book by its cover. I am glad I read the story synopsis and thought it sounded rad as well. This would be a great book to use that Christmas book money on or gift to your bibliophile friends who love murder mysteries, feminist fiction, Doctor Who, and Sherlock Holmes. I think fans of Outlander are going to fall in love with the Kendra Donovan series. Kendra Donovan is the twenty-something offspring of ambition-driven, cold and calculating parents. The story of Donovan’s parents and her past sound like they were equally plucked from the early twentieth century and some time in the future. This will make sense if you read the book and are familiar with the term eugenics. While the first third of Kendra’s story unfolds in the present, the majority of the book takes place in a castle. In nineteenth-century England. DELIGHTFUL. It was entertaining to listen to Kendra’s thoughts as she compared and contrasted the customs and rituals of polite and lower-class society in 1815 to the customs and social class divisions of our present time. There was a fun Upstairs, Downstairs/ Downton Abbey atmosphere to the story. Unfortunately for Kendra, she was plopped “downstairs” when she travelled back in time, and there are some hilarious moments in which things just aren’t working out for her and she loses her cool. There is great blend of Jane Austen and Sherlock Holmes-esque imagery and plot in the novel. It was fun to witness how the modern FBI agent had to mask her modern crime detection skills under the guise of being a uniquely educated foreigner. …And like this in the 19th century (although her hair is very different as described in the book). The main character often references some of the most familiar historical aspects (writers, tropes, concepts, philosophies) of the time period while trying to navigate her way around society. It might come off as trite, but the reader has to remind themselves that Kendra Donovan is a brainiac, prone to encyclopedic thought-streams. If you are looking for something with the level of romance and rendezvous that the Outlander series had, then you will be a little disappointed. While there is the hint of a developing romance throughout the book, we do not see any real ”action” until the end. But I liked this aspect of the novel. I enjoyed that the novel focused on this strong and smart, liberated woman solving crimes instead of her swooning over some English heartthrob. That being said, the story ends in a way that lets us know there is definitely more romance to come in the next novel. 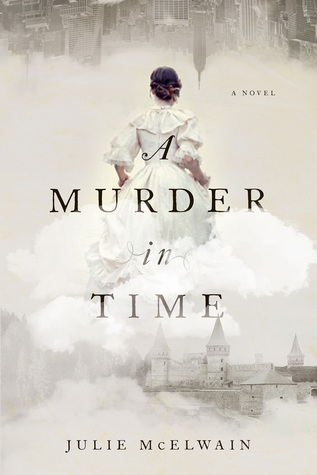 Overall, A Murder in Time was an action-packed, atmospheric, fun and absorbing read. I am excited to read the next novel in the series, A Twist in Time, due out this April.